8:05am A report of a possible odor of drugs was received and investigated. The report was unfounded. 10:35am A parking complaint on Washington Square was investigated. 11:59am An officer spoke with an E. Mansfield St. resident reference a trespass issue. 12:24pm A suspicious person in the 1100 block of Hopley Ave was investigated. 1:16pm A non-injury accident report was taken on Washington Square. 1:23pm Officers delivered a release notification in the 300 block of Emerson St.
1:29pm A subject came on station to report she is a victim of identity fraud. Officers are investigating. 1:59pm Officers investigated a report of stolen property, found in the 500 block of W. Charles St.
2:34pm A report of a vandalism is being investigated in the 100 block of W. Charles St.
3:12pm Officers checked the 300 block of E. Irving for two suspicious males going door to door. The men were not located. 3:26pm Joelena Young, 19, was arrested for Falsification and Theft. She was issued with a criminal summons for both chargers and released with a pending court appearance. 3:26pm Jeremy Smith, 21, was arrested for Theft. He was issued a criminal summons and released with a pending court appearance. 4:57pm Officers checked the welfare of a dog left in a car. 5:22pm A report of a dog being struck on Plymouth St. was investigated. 5:48pm Officers check a report of a building being open on Poplar St.
7:10pm A disturbance was investigated on Arrowhead Dr.
7:25pm Officers spoke to a person about a civil issue. 7:37pm A report was received about a person being bitten by a cat. 7:51pm A 911 hang up call was investigated. 8:10pm A report of two suspicious persons was investigated in the 700 block of Ann St.
8:14pm A 911 hang up call was investigated. 8:18pm A report of a person being bitten by a dog was investigated. 8:44pm Officers on patrol checked on a stray dog in the 400 block of N. Sandusky Ave.
8:55pm Officers checked on a possible traffic hazard in the area of Fairview Ave. and Lavina Ave.
9:07pm A female reported being chased by a loose dog at Aumiller Park. 9:26pm A report of a juvenile that had not returned home was investigated. He was located and returned to his father. 9:38pm A 15 year old juvenile was arrested for underage possession of tobacco. He was released to his parents and will be contacted by Juvenile Court with a pending court appearance. 9:51pm A trespass complaint in the 100 block of W. Liberty St. was investigated. 10:03pm A report of 2 young girls riding bicycles with no supervision in the area of Songer Ave. and Wingert St. was investigated. 10:09pm A report of a suspicious vehicle at Kroger was investigated. It was found to belong to the store manager. 10:58pm A report of a fight in the 700 block of Ann St. was investigated. All parties in the area stated there was no fight. 11:32pm A false alarm in the 900 block of Ann St. was investigated. 12:16am A resident reported hearing juveniles talking in Oakwood Cemetery. Officers found no one in the area and the buildings secure. 1:08am A report of a suspicious male in the 300 block of N. Sandusky Ave. was investigated. 1:16am Officers assisted Bucyrus Fire Dept. at Bucyrus Plaza. 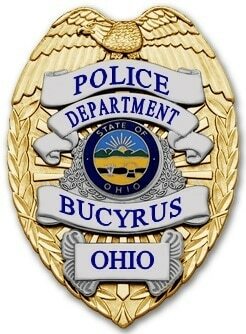 2:15am Officers mediated a domestic issue at Bucyrus Estates. 12:15am Nikki Zealor, 30, was arrested on 2 warrants out of Crawford County. She was issued with a date to appear in court and released. 2:31am A 17 year old male was arrested for Curfew violation. He was released to his mother and will be contacted by Juvenile Court with a pending court appearance. 2:36am A resident in the 800 block of Clay St. reported his vehicle vandalized. 6:07am A breaking and entering in the 1300 block of E. Mansfield St. is under investigation.